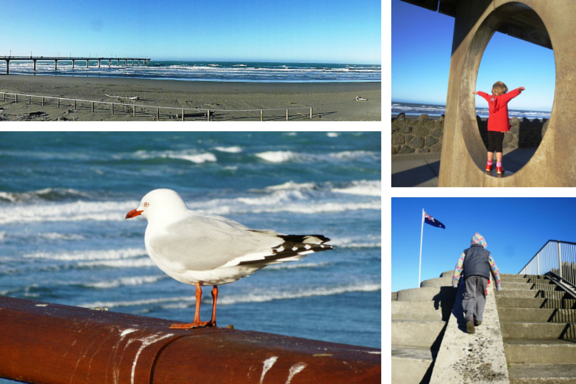 If you’re after a seaside experience, New Brighton has a lot going on. Take a stroll to the end of the 300 metre pier, check out the playground and infamous Whale Paddling Pool, grab a coffee or ice cream, and of course feel the sand between your toes! There’s often a Mr Whippy van parked in the main car park beside the kids’ playground and you can get coffee, ice creams, and cafe food from the family-friendly Salt on the Pier cafe, which is part of the library building. There’s also an ice cream kiosk across the road but it may only be open at peak times (summer). There are toilets downstairs inside the library building, and in the beach changing rooms by the kids’ playground. We visited the pier in July 2015 (winter). View of the library from the small library car park. Walking back down the pier. View of pier looking south. Stroll 300 metres out into the ocean. Under the walkway to pier. Gulls using paddling pool in winter. Fun climbing the steps in the amphitheatre. Most famous paddling pool in Christchurch? The New Brighton Library and clock tower. Magnificent tree between the library and playground. The first New Brighton Pier was opened in 1894 as a recreational destination in the traditional British style, and it was pretty popular for about 70 years. By 1965 it had become so run down it needed to be demolished. It took 30 years of fundraising and lobbying to get the fantastic pier and library we have today. The new pier was officially opened in 1997 , and the library, which has won many awards, was completed in 1999. There’s an amazing ocean view from the upstairs reading chairs. New Brighton Pier lights up for Guy Fawkes each year on November 5. Join the crowds for amazing fireworks displays.